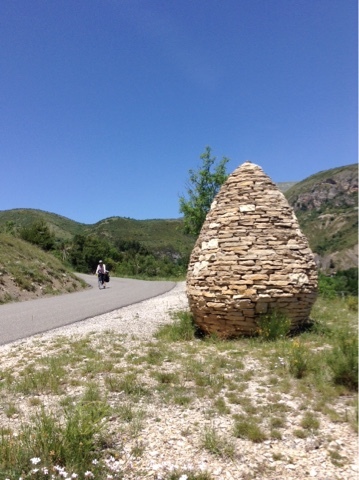 We were speeding down the seven per cent grade in the saddle between Saint-Geniez and Authon when all of a sudden in a sharp hairpin in the road we were upon one of several cairns that Andy Goldsworthy has constructed in the region. If we hadn't known about it, we would have been dumbfounded by this unlikely "Sentinel" in this wild, largely unsettled region of France on the fringe of the Alps. Though our jaws didn't drop too dramatically, we still couldn't help but gasp in wonder upon sighting it, even though we well knew we were nearly upon it. It and it's cousins were what had drawn us to bicycle two hundred miles to this region. Janina had been wondering if it was worth it as we had to climb more than ten miles over the Col de Fontbelle to reach it. The temperatures had escalated and Janina was wilting. Not only was she largely walking the climb, on the steeper stretches I was abandoning my bike and walking back down the road to push her bike for her. I'd bike a tenth of a mile, jog down to her and push her bike beyond where I'd left my bike, return to my bike to ride up the road a bit and repeat. Needless to say, this was no fun, but it was becoming a survival situation. It was day eight of our ride and rather than getting stronger, despite a couple of rest days and just a few hours a day on the bike, Janina was getting weaker. She had adopted the Dwight strategy of training for this ride--doing none and suffering for the first week as one gained their condition. That isn't my style. It works for Dwight, but it hadn't worked for Janina. I had repeatedly urged her for months to get in several twenty mile rides a week the month before she left on the several wonderful bike paths through the woods in her suburb, but she didn't think that was necessary. This wasn't exactly like trying to run a marathon without any training, but nearly so. I thought she would be done in on the initial nine-and-half mile climb that she rode so effortlessly to start the trip, but that turned out to be the pinnacle of her efforts. It was noon and we had only ridden ten miles from Sisteron despite getting on the road at 7:30. After a rest at Saint-Geniez, where we might have packed it in and stayed at a gite, we pushed on knowing that the road leveled off a bit and even descended for a stretch in the remaining miles to the summit. From the summit it would be a quick downhill to Thoard, where a campground and another Goldsworthy work awaited us. But the sun quickly became too much for Janina. She was saying she'd never ride her bike again. She is prone to rash statements, so I knew this one wouldn't hold true. She remembered suffering heat stroke in Mexico forty years ago and didn't want to repeat the experience. 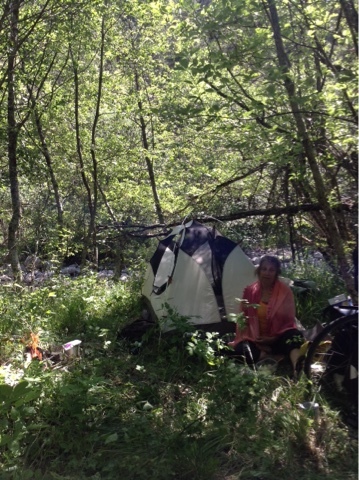 Though the sun was strong, we could cool down quick in the shade of the infrequent trees along the road. With no humidity and an actual chill in the air out of the sun, we weren't dehydrating by any means. Just after the descent past the cairn when we resumed the final two-mile climb to the summit, which could take over an hour with our relay system, we came to a thick forest with a creek running through it. The terrain had been near-lunar until then, so the forest was akin to an oasis, an irresistible gift from the cycling gods. "Should we camp here? "I asked Janina. "That's the best idea you've had all day, if not the entire trip," she instantly answered and was spontaneously transformed from a morose, near-cadaver to her normal chipper self. It didn't take us long to find a grassy patch under some trees right alongside the stream. Lewis and Clark never had it better. There were flies, but they didn't bite. It was only 1:30. I still had three-and-a-half bottles of water and Janina two-and-a-half, but I wasn't sure if that would be enough to get us through the night, so I gathered some rocks for a fire pit to boil water. As it was, I needn't have. When we set out in the morning we still had two bottles of water remaining, as good a gauge as any that we weren't threatened by heatstroke. Unbeknownst to us, we were camped right outside Authon, so we were able to fill our bottles before we'd even ridden half a mile. We had a pleasant break in Thoard, but denied ourselves the Goldsworthy there as it was in a chapel that required a strenuous, uphill hour-long hike to reach. The sun was already feeling intense at ten a.m. and we had been discouraged from trying to make the hike by both the young woman who sold us our daily baguette and two woman in the mayor's office. If we had reached Thoard the afternoon before, as we had hoped, we could have set out early to reach it, but we will have to save that for another visit. It would have been a perfect outing if Craig and Onni hadn't had to cancel out on meeting up with us. They were going to drive over. With their car we could have easily made it a day trip out of Digne that we all would have greatly enjoyed. Our descent to Digne was interrupted by another col, just what we didn't need. At least it was only a three-mile climb and with a gentle enough grade that I could push Janina much of the way. The final seven-mile descent was prolonged by Janina's leeriness of gaining too much speed. When the grade exceeds a couple per cent, she holds her speed to five miles per hour. She takes twelve minutes to ride a mile while I'm knocking them off at a two-minute clip flying at thirty miles an hour. That added up to more than an extra hour in the sun for her on this last stretch. It was turning into another scorcher of a day, our second in a row. Even the locals were complaining how hot it was. We thought we might treat ourselves to the hostel, but it didn't open until six. We were leery about any indoor accommodations in this heat, since air-conditioning is a rarity here, so settled on a campground a mile out of town along a river. It was packed, leaving a not very good selection of sites. We passed one with the shade of a couple of trees not knowing it was the best one available. When we doubled back for it, someone else was claiming it. That left Janina in such a heap of misery she couldn't motivate herself to go take a dip in the pool, something she'd been looking forward to all day. At least we will have a couple days of minimal biking and on unloaded bikes here in Digne to search out more of the Goldsworhty art. We already visited the Musée Gassendi that had a room devoted to him and a wall in another room of cracked clay with a serpent of clay winding through it. The region abounds with fossils. The most remarkable is of a mermaid figure discovered by a Catholic priest in the 1930s. It was accompanied by a most convincing video. We kept looking for a disclaimer after the exhibit, explaining that it was their version of a mockumentary. If it's true, Werner Herzog needs to know about this. Craig bought a tandem here in France several years ago. It may have been sitting in his hallway when you visited. He only managed to get his girl friend out on it once or twice. He sold it a couple months ago. We were both disappointed he and I never gave it a go. 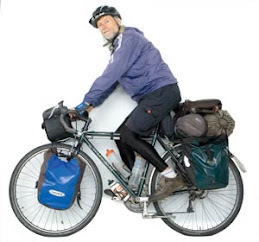 I have raised the issue of a tandem with Janina and she has been opposed. George, have you thought of posting a map with your entries. When I was in Myanmar last winter, Jesse asked me to do it. So I took a colored marker and updated my route. Then I photoed it and posted it. As it is now, I open Google maps with each post I read to see where you physically are. And yes, a tandem sounds great. But my partner Susan refuses to ride on it. She is so worried about 'slowing me down'. I am not. But if she rides slower than me on a solo bike, she is still 'slowing me down'. What's the difference?